On March 25, 2011, a Qatar Air Force Mirage 2000-5, took off from Souda Air Base, in Crete, to help enforce a no-fly zone protecting rebels being attacked by Libyan strongman Muammar Qaddafi. Qatar was the first Persian Gulf nation to help the U.S. in the conflict. Qatari operations were more than symbolic. The Qatari military trained rebel units, shipped them weapons, accompanied their fighting units into battle, served as a link between rebel commanders and NATO, tutored their military commanders, integrated disparate rebel units into a unified force and led them in the final assault on Qaddafi’s compound in Tripoli.“We never had to hold their hand,” a retired senior U.S. military officer says. “They knew what they were doing.” Put simply, while the U.S. was leading from behind in Libya, the Qataris were walking point. That view has been reflected by both Mattis and Tillerson. Six days after Trump’s statement, Mattis met with Qatari Defense Minister Khalid al-Attiyah to sign an agreement shipping 36 F-15 fighters to the Gulf nation. The $12 billion sale had been in the works for years, so Pentagon officials were able to claim that it had not been fast-tracked by Tillerson, whose department oversees arms transactions. 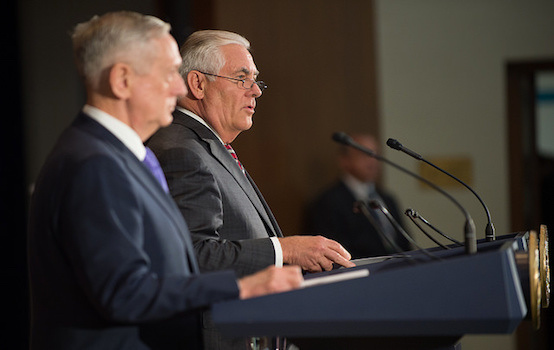 But the Mattis announcement seemed suspiciously well-timed to signal Mattis’ and Tillerson’s views. But the single most important reason for the Qatar tilt is obvious to anyone who knows how to read a map. The U.S. leases the al-Udeid Air Base, southwest of Doha, which is home to the Air Force’s 379th Air Expeditionary Wing. The U.S. (and the Qataris), not only mount fighter-bombers from al-Udeid against ISIS units in Iraq and Syria, the base serves as the first line of defense against Iranian encroachments in the region. Even more crucially, al-Udeid not only protects America’s Persian Gulf allies, it protects Israel – and would be a launching point for U.S. aircraft against Iran were Israel to be attacked by the Islamic Republic. More crucially, particularly from Mattis’s point-of-view, the Saudi-Qatar feud not only shattered the anti-Iran coalition the administration cobbled together during the president’s trip to Riyadh, it redrew the geopolitical map of the Middle East. In the wake of the Saudi-Qatar falling out, Turkey pledged its support for Qatar (and deployed troops to a Qatari military base to guard Qatar’s sovereignty), while Iran took steps to help ease the Saudi-imposed blockade.